Mauro Panunzio is showcasing his azadiene hetero-Diels-Alder protocol with the synthesis of antidepressant Venlafaxine (DOI). Earlier in 2006 he target-practised on Prozac and duloxetine ( DOI). Here is how it is done. 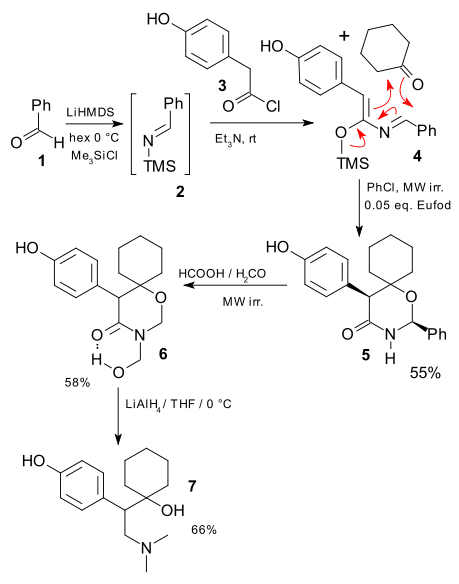 Benzaldehyde (1) is added to LiHMDS to imine (2) which reacts as a nucleophile with acid chloride (3) in a nucleophilic acyl substitution to azadiene (4). HDA reaction of this intermediate with cyclohexanone is mediated by Lewis acid Eufod and microwave irradiation to lactam (5). Formaldehyde adds a hydroxymethyl group and the phenyl group is removed in (6) with formic acid in a transketalization again using a microwave. In the final step Lithium aluminium hydride opens both hemiaminal groups to Venlafaxine (7).